Once you need to restore parts of your car to keep it in good shape, the door is open for its qualities to diminish quickly if those parts are not that good. Especially when it comes to classic cars. So you better make sure that you find the best option for finding those restoration parts. 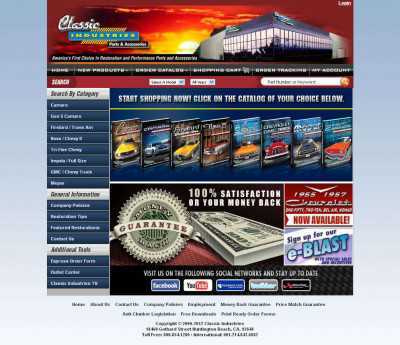 One place where you can find them is ClassicIndustries.com, the site of a business that’s been around since 1976 and which is based in California. The company’s strength is the high quality of their colorful and detailed catalogues which allows people to buy with confidence the restoration parts for their cars. The car models in which this business specializes are Camaro, Bel-Air, El Camino and Chevy & GMC Trucks. The best brands in this business are available on Classicindustries, such as Air Ride, Auto Meter, B&M, Lokar, and Edelbrock among many others. A simple search tool is located at the top of the site under the main menu. In it you can choose the model and year of the car for which you want to find some restoration part. There’s also a section for browsing products by category, and you’ll be surprised to see the amount of different products you can find at Classicindustries.com. The site’s also full of tips and informative texts on restoration, and has a team of experts working with them for you to make them all the questions you need in case you are not sure on how to make the restoration yourself. Classicindustries.com gives you as well a good way of having your favorite cars a bit closer, by making some wallpapers of really beatiful classic cars available for download. In this way, your desktop will also have a classic feel. Recognized as the undisputed leader of the Restoration Parts industry, Classic Industries is one of the largest and respected distributors of reproduction, performance and original GM and MOPAR parts and accessories in the industry. These guys have grown quite a lot since the founding of their business. It is a natural consequence that their webpage has the same quality that has allowed for such growth. Will they add products from other types or car models or will they stick with the ones they already work with?